Cymbidium wenshaense outcross #2780 ('Stony Point' x 'Lisa') (approximately 25 seedlings per flask). 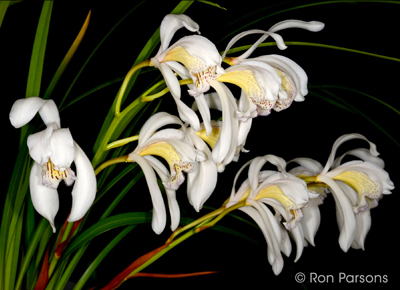 The Species: This moderately sized Cymbidium species was first described in 1990. It comes from Yunnan, China and northern Vietnam where it grows as an epiphyte at elevations from 3300 to 5000 ft. The fragrant flowers are carried with 3 to 7 per inflorescence. Culture: I have grown this in cool, bright conditions with year round watering. It should do well in intermediate conditions as well. It has done well potted in fine bark mix. Also, it may benefit by a lessening water during the winter. Capsule parent: Cymbidium wenshaense. I didn't take a photograph of my plant in flower. This is a friend's plant and gives a good sense of the flowers.